Purina® AntlerMax® Deer Chow contains our AntlerMax® Protein & Mineral Technology. It promotes antler growth by improving protein quality with ideal amounts and ratios of vitamins and minerals for optimal antler growth. Purina® AntlerMax® Deer Chow also helps milk production, milk quality and strong, healthy fawns with high survival rates. 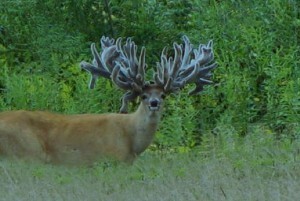 This entry was posted on Sunday, August 19th, 2012 at 7:19 pm	and is filed under articles, News & Updates, Wildlife, Deer. You can follow any responses to this entry through the RSS 2.0 feed. Both comments and pings are currently closed.